No, Assam Month has not run off the tracks. In fact, we'll soon have a review of one of the best Assam teas I've tasted. So stay tuned. In the meantime I thought I'd share some information on a lesser known tea growing region - the United States. I touched on the topic briefly in an earlier entry, which also mentioned a tea-growing project in England. You can read that entry here. Not long ago Reuters ran a fairly lengthy piece on the Charleston Tea Plantation, which is now owned by tea giant Bigelow and which grows the leaf that makes up American Classic Tea. Read that article here. After reading the Reuters article you might think that South Carolina is the only place in the United States where tea grows and on this scale it certainly is. But tea is also starting to turn up in a state that's a lot better known for its homegrown coffee. That would be Hawaii, of course. The Associated Press recently ran a piece on tea cultivation in Hawaii, where they are apparently in the early stages of trying to come up with a tea geared more toward connoisseurs. The article ran in the Honolulu Star Bulletin and the Honolulu Advertiser. It's essentially the same story, regardless, and you can read it here or here. 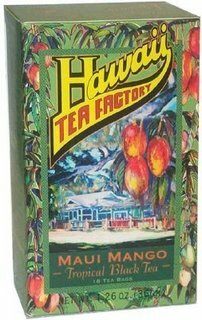 While we're on the subject of Hawaii and tea it's as good a time as any to mention Hawaii Tea Factory. Though they don't use any native grown tea, they do make two flavored black teas and an herbal variety with flavorings usually associated with the islands. They've got a Mango Tropical Black Tea, Passion Fruit Black Tea and Pineapple Herbal Tea. Click Here For Gourmet Teas! I would much rather see 'Hawaii Tea Factory' grow their tea in Hawaii. Mixing it in Hawaii & using the company name is misleading though the content does get posted as an import. Hopefully growing tea in Hawaii is sucessful.